Anne Docherty has sprung upon the Scottish and British Masters scene, at a mature age but with considerable success. With luck, her freshness, enthusiasm and friendliness should ensure several more years of varied and interesting achievement in challenging sporting events. I had never been a runner – just couldn’t do it. But I have always been a swimmer of sorts. My husband and I used to regularly walk in the hills and had quite a few Munros under our belts. However, he broke his ankle and it never repaired very well, also he now has 2 new hips, so our hill walking days sadly are over. I tried the gym for a while, but I am never happy being inside. With great fear and trepidation one day I stood at the front door, clad in my hill walking gear with old trainers on – heart beating rapidly before I had even started – and I set off for a trial “run” in the woods behind our house. Once out of sight of any one I found I could sort of gently run. I decided that as I was nearly 60 (10 years ago)and retired from lecturing, this could be my challenge, and started to “run” about 3 times a week for about 30 minutes around what is now my “cosy woodland route”. Two neighbours whom I did not know very well, Fran and Jackie, eventually persuaded me to join the Forres Harriers, running slowly and patiently with me. I could not run to the extent that I do without the support of my husband – who is always there to encourage me. Also my family and grandchildren. There is nothing more thrilling than hearing them call “Come on Nanna”, waving their home made banners. Also of course my two friends and neighbours, as above, who are great supporters. 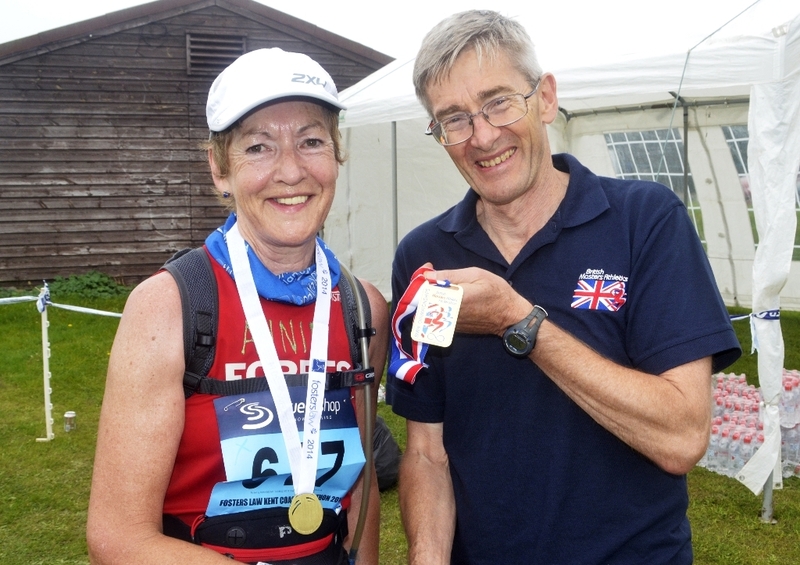 However, without the support and friendship of my fellow Forres Harriers and Club Captain Susan, I would be just another old grannie! I am certain that I would not have achieved so much without belonging to the Harriers. An opportunity to get out into the fresh air and explore new places. I am now very brave, and have discovered all kinds of exciting places when running in unfamiliar areas on my own. I also get a feeling of freedom, a sense of identity and fitness. Probably winning the Loch Ness Baxters 10K for F60+ this year. It was my pb and just felt good all the way – topped by a most unexpected win on a perfect day. Also I am very pleased with my recent performance in the Speyside Duathlon, which was just about my toughest challenge so far! Winning the 2014 BMAF W65 Cross Country was just amazing as I am not at all a confident Cross Country runner as I fall over a lot! I always do my best, and therefore don’t ever feel I have a “worst” experience even if times are slow. None. I just take each day/challenge as it comes. Swimming and cycling. Triathlon. Quilting. Walking. The friendship of fellow runners. A sense of fitness which without running would have been difficult to achieve. Exploring both local and new areas. I am never afraid to stop to enjoy the view or experience! It depends on what I am training for. I always run about 5 days a week. For a marathon up to about 50 miles a week – including one day hills and one day speed. I always follow a training plan as much as I can. If I am also training for a triathlon I include swimming and cycling as well, fitting everything in as much as possible. I do find that when I fit in swimming and cycling with marathon training, I feel on top form. I am doing that just now. 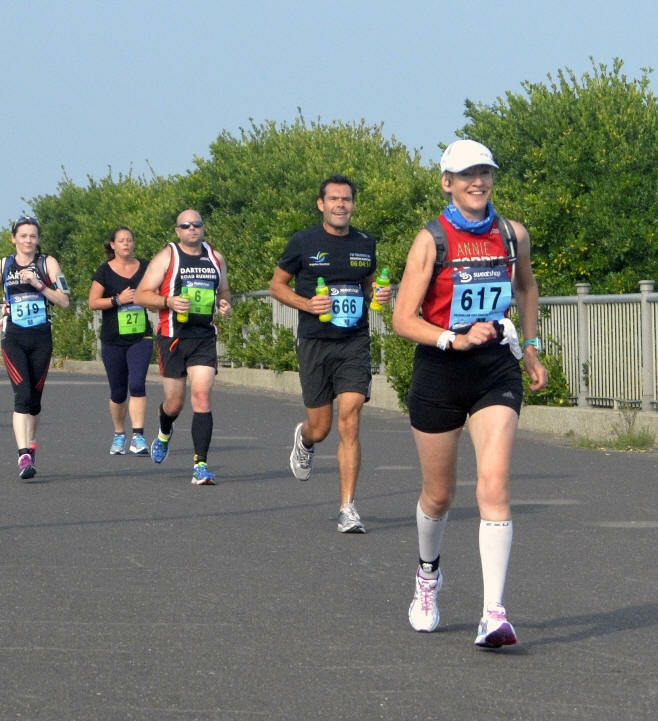 I hope to run in the Thanet Marathon , my 16th marathon, near Margate in September, and the week after that to take part in the Grantown on Spey triathlon. When I am not training for a marathon I probably run about 30 miles a week.